SANTIAGO, Jun 29 2017 (IPS) - Chilean President Michelle Bachelet’s formal apology to the country’s Mapuche Indians, for the “mistakes and atrocities” committed against them by the Chilean state, is seen by indigenous and social activists in the central region of Araucanía – the heartland of the Mapuche people – as falling short. Native leaders in that region are calling for concrete actions and policies with regard to key questions such as their demands for self-determination, respect for their rights to their ancestral land, water use rights, and an end to violence against indigenous people. The latest incident took place on Jun. 14, when members of the carabineros militarised police used tear gas during a raid in a school in the town of Temucuicui, which affected a number of schoolchildren and local residents. On Jun. 27, lawyers at the government’s National Human Rights Institute filed legal action on behalf of the schoolchildren in that Mapuche town of 120 families, in the region of Araucanía. 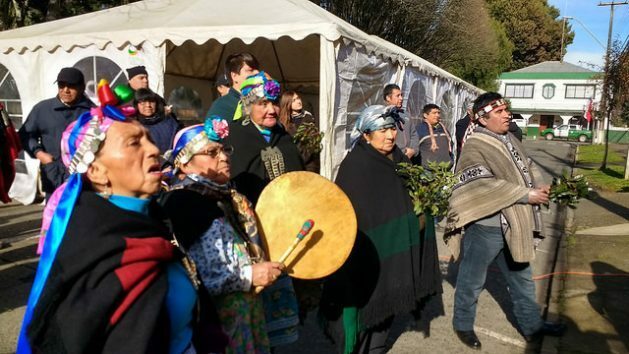 “This apology and acknowledgment that mistakes, and especially atrocities, have been committed is important,” said Adolfo Millabur, mayor of the town of Tirúa, the hub of the Mapuche people’s ancestral territory, with respect to the Jun. 23 request for forgiveness by the socialist president, during the launch of a Plan for Recognition and Development of Araucanía. 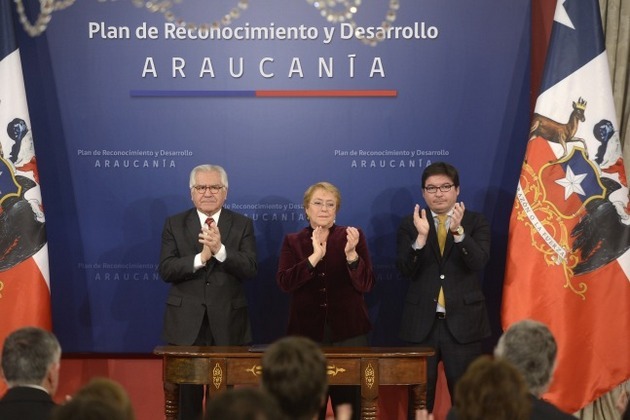 “I think it is positive that a president of Chile has recognised mistakes and above all atrocities committed after the Chilean state’s invasion of Mapuche territory started in 1860, in the misnamed ‘Pacification of Araucanía’,” he said. The “Pacification of Araucanía” was a brutal military campaign by the Chilean army and settlers that ended in 1881 with the defeat of the Mapuche people, leaving tens of thousands of indigenous people dead and leading to the reduction of Mapuche territory from 10 million to just half a million hectares. “Children are suffering, there are victims of all kinds, Mapuche people have died, and there is no indication of how the state is going to act in the immediate future, if it is going to continue to militarise the area as it is doing now,” he added. The mayors were referring to the prosecution of Mapuche activists accused of setting trucks on fire, and the continuous raids on Mapuche homes and buildings, such as the one in the school in Temucuicui. Mapuche activists have been arrested and prosecuted under the 1984 anti-terrorism law, put in place by the military dictatorship of Augusto Pinochet (1973-1990) and still in force, which allows witnesses to conceal their identity while testifying, and provides for longer periods of arrest on remand and extremely heavy sentences. According to the last census, from 2012, 11 percent of Chile’s population of 17.7 million people identify themselves as indigenous. Of the country’s 1.9 million indigenous people, 84 percent are Mapuche. Smaller native communities in Chile include the Aymara, Atacameño, Pehuenche and Pascuense people. The priest was referring to the low level of representation of Mapuche leaders on the Araucania Presidential Advisory Commission, appointed by Bachelet in January 2015, which wrapped up its work in January with a package of proposals that included a suggested apology by the president. “If she wants to talk about collective rights, (Bachelet) should be reminded of the treaties signed by Chile, such as convention 169 of the ILO (International Labour Organisation) and the United Nations Declaration on the rights of indigenous people which, among other things, declares their right to self-determination or autonomy, terms that are absent from her plan for Araucanía,” Bresciani said. Jorge Pinto, a history professor at the Universidad de La Frontera, a university in Temuco, the capital of Araucanía, who sat on the commission set up by Bachelet, told IPS that the government’s new plan for that region is “sound and complete” and interpreted the apology as a gesture aimed at reactivating dialogue. Social activists and indigenous leaders admit the value of some of the initiatives included in Bachelet’s plans, such as the official declaration of Jun. 24 – We Xipantu, the Mapuche new year – as a national holiday, and a stronger effort to teach Mapuzungún, the Mapuche language, in schools in their communities. They also applaud the proposal to explicitly recognise native communities in the projected new constitution, which would replace the current one, which dates back to 1980 and is a legacy of the Pinochet dictatorship which successive democratic governments have failed to replace, implementing limited reforms instead. Activists say however, that the measures taken so far have been inadequate, and point out that Bachelet’s term ends in just nine months. That will make it difficult to bring about real actions in areas such as land ownership and water use rights, which are key to a regional economy dominated by the interests of large logging, hydropower and mining companies. Former right-wing president Sebastián Piñera (2010-2014), who is the favorite in the opinion polls for the November elections as the likely candidate for the Chile Vamos alliance, supports Bachelet’s apology to the Mapuche people.